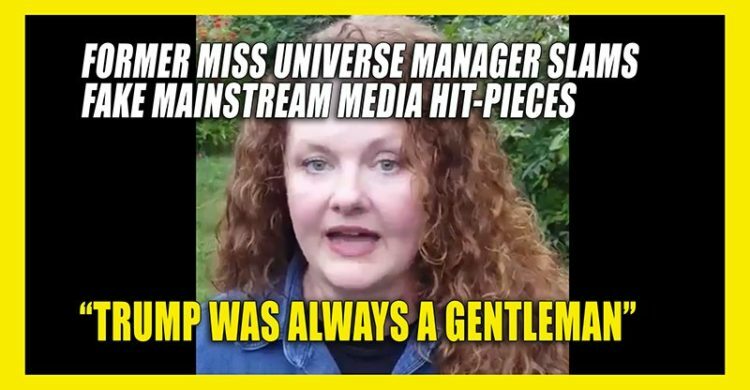 A former Miss Universe manager, who was actually a clothing coordinator, has come out in defense of Donald Trump, calling him a perfect gentleman. First off, I have no idea if the accusations against Trump for sexual misconduct are true or not. I do know that on that lewd tape that was released he bragged about actions that are identical to the accusations. It’s not a huge leap to connect his actions with those charges. Just sayin’. But so far, there is no real proof of it, so I’m withholding any judgement until I see solid proof. Having said that, this woman only met Trump once I believe, where he joined in on a conversation with her and Miss Virginia. He was a gentleman evidently at that time. The woman also claims that if Trump had done anything wrong, these women would have come to her before their families. I highly doubt that. This whole thing is being painted as the ultimate blow to a fake media hit on Trump. But I haven’t seen evidence on either side yet that is definitive. It’s all he-said, she-said. As the Pro-Hillary / Pro-Globalist controlled mainstream media continues to parade around clowns seeking their 15 minutes of fame by claiming Trump said something that hurt their feelings 3 decades ago, this woman who has actually WORKED professionally with Trump has had enough. Watch as she speaks up and reveals the TRUTH about Donald Trump. Frankly, it is suspect when women come forward from thirty years ago to accuse a man of wrong doing. However, one of the charges is from 2013. Still, why didn’t she come forward when it happened? Obviously, the media is out to get Donald Trump. They laid a trap for him over all this and Trump’s genius adviser, Bannon, let him walk right into it. It’s a classic Liberal snare and they set Trump up perfectly for it. Trump is going to have to do a lot better at disproving all this and denouncing it. While this woman is a good start, she is hardly a panacea for these charges. And I’m sorry, but Trump has not always been a gentleman. That is a ludicrous statement and words and actions do matter, regardless of how you spin it. The media smells blood here. They think they have fatally wounded Trump. He better get aggressive and get back to the issues at hand before they bludgeon him with his past deeds, real and imagined.